I've been meaning to show off this picture of my oldest granddaughter for a while now but keep forgetting. This is her and her dad. It was taken at a Daughter-Daddy dance at her school a few months ago. It must be nice to be so young and not have to worry about products for exposed skin care yet. I could certainly use something on my old wrinkly skin. In other news: I went out yesterday. I HAD to go to the dentist but while I was out I also went and got my hair cut and then went and bought a couple pairs of jeans and a new purse. The panic was minimal. Yippeee! What a precious photo!!! She's adorable! WoooHoooo on the going out and minimal panic! 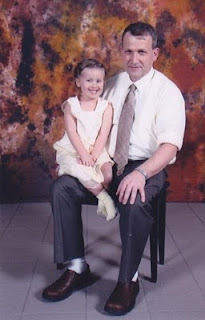 what a lovely photo...and what a great opportunity for a daddy and duaghter photo op.